When the plane landed in Düsseldorf, I was so happy to be back and couldn't wait for my next adventure: the trip to Leer, where Lisa's parents live (the word "leer" means "empty in German, so I kept calling the town "empty"). That morning I met up with Lisa and we went to Düsseldorf, where we took the train with David, his skate chair and our friend Anna. At that time I had to study for my first exam, which consisted in performing a short play in German. In order to pratice, I needed someone to play the part of my husband Horst, so I brought all the papers with me and asked David to read his part...then he started making fun of my accent and we all started laughing (but, a few days later, I passed the exam with a very good grade!). When we got there, Lisa's dad picked us up and managed to put all four chairs in the car. We went home and grabbed some food, then we went to my first punk rock concert and we rocked the night away. The next day I woke up and enjoyed a real German breakfast (they eat more than just sweet stuff! ), Lisa's mom even spoke Italian to ask me how I wanted my hot chocolate! Then it was time to visit the biggest indoor skatepark in Germany. It was a fun day and I practiced for the drop in (my skating goal of the semester). When we got home, dinner was ready! It was so nice to finally be able to eat some real food instead of Döner ;) and it tasted really good (thanks Simone!). A few days later, my friend Philipp came to visit me and we all went to dinner at Lisa's place (she made real pesto!). She and her mom listened to my rants for a while, then we went back home and we almost missed the last train. I had a lot of fun skating with Philipp on Saturday, and he left some blood and his train ticket at the park. It was snowing the next day, so we played in the snow for a while and I really enjoyed rolling around in his Box chair. Somehow, we managed to get to the skatepark in the afternoon, had some more fun and got his ticket back. Then he took his train and went home. On the following week I studied a lot with Lisa, and waited for my parents and my best friend Tina to come visit me. I had some fun showing Tina some of my favorite places covered in snow and teaching her something about German culture. February was the hardest month, I had to study hard for my exams and I knew I didn't have much time left in Bochum. I passed all my exams and survived broken dryers and bad weather. Ina started following me around and filming my awesome life, it was fun (she is almost as crazy as me)! I even took her to the skatepark and taught her a couple tricks, she learned pretty quickly! 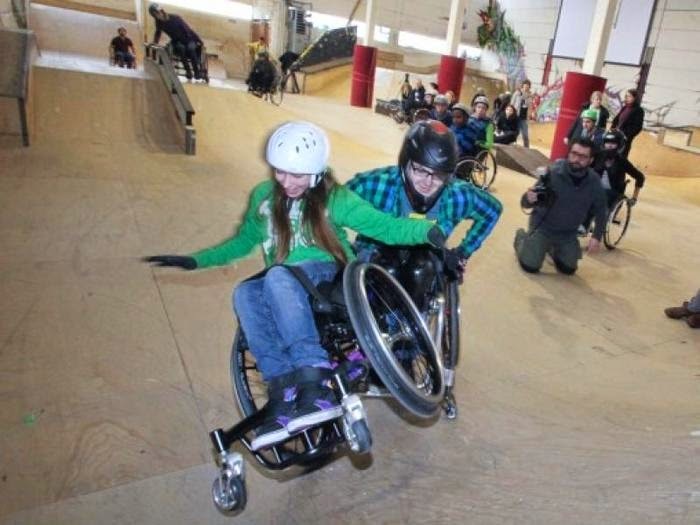 My last big adventure with Lisa and David was the WCMX workshop in Wiesbaden. Anna and I woke up early in the morning in order to get there on time. The skatepark was full of journalists and cameras (I even ended up on TV!). I spent the day skating on Lisa's new chair, chasing a little kid in the park and trying to teach a journalist some wheelchair skills. On that night I went to Megan's birthday party with my friends. It was my last week in Bochum, so my dad came to help me pack my countless bags. I was so unhappy, I really didn't want to leave. The rest of the week was so hard for me, I had to say way too many goodbyes. I didn't want to leave the place where I learned so much, and all the awesome people who made me so happy during this semester. This city will always be a part of me, it has seen me grow and become the person I have always wanted to be. Bochum gave me wings. And I will use them to go back soon.